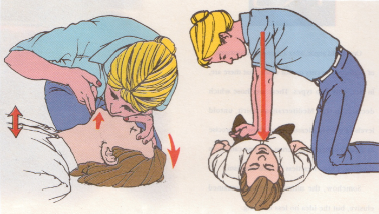 The first step in CPR is opening the airway by tilting the head back and the chin up. Second is mouth-to-mouth breathing: nostrils are pinched to keep air from escaping. Third, the breathing is alternated with compressions of the chest. Weight is transmitted vertically downward, with elbows straight and locked and shoulders over hands. The cycle is two breaths, then 15 compressions down over 9-11 seconds. (It helps to count 'one-and, two-and, three-and' etc). These instructions are appropriate for children over one year old. Lay the victim on his / her side. Kneel beside the shoulder and look for chest movement. Listen for breath and feel for breath on your cheek. turn victim's head to one side. Pull the tongue forward and clear air passage of vomit, seaweed, chewing-gum and dentures. Tilt the head to obtain an open airway. Place on hand on the forehead, life the chin gently with the other. Pinch the victim's nostrils, take a deep breath and cover mouth-to-mouth (for a small child, cover both mouth and nose with your mouth. Blow quickly four times without interruption and look for chest rising. If it doesn't, recheck that the airway is clear, or improve the mouth-to-mouth seal. Take deep breath while victim's chest deflates. Continue breathing into victim about 16 breaths per minute (20 for a child). If spontaneous breathing begins, turn victim into recovery position on his side - head positioned to ensure airway open, uppermost arm and leg bent to support the body, other arm placed alongside back to prevent rolling. This position prevents the victim from choking on vomit. Once you have the breathing, try not to let the victim die of hypothermia. Remove wet clothing, wrap in blankets, sleeping-bag, towels or coats. Giving nothing to eat or drink - especially not alcohol - and get expert medical aid immediately.